Organizing professionals estimate that only 30 percent of us store our cars in the garage. The reason? Too much stuff! Before the snow and ice hit again this winter, clean out your garage so you can keep your car safe from the elements. The garage is typically the home for all the items we don’t immediately need, like seasonal decorations, items with a specific “outside” purpose, and all the projects that we think we will tackle “someday.” As a result, junk tends to pile up the fastest there than any other spot in your home. Don’t let that intimidate you, though! Cleaning out your garage is just like any other decluttering project. Set aside at least a full day, or even a full weekend or two, to get the job done. Dedicating enough time to the project will make the experience less stressful, and allow you the time to focus on completing the project. Make decluttering a family project! Get the kids involved with sorting through their old toys, dusting shelves, and sweeping the floor. Make it fun by turning the decluttering into a competition, and reward the whole family with a special treat when you’re done! Start with the “easy” stuff. Toss out or recycle items that are broken beyond repair, expired household chemicals (which may need special disposal), and any other trash that has been piling up. Go through absolutely everything, whether it’s a box that you didn’t unpack when you moved in, or toolbox you access all the time. Now that you have figured out what you want to keep, you need to make sure it’s organized! (Otherwise, the garage will end up the same as always.) Before you put everything back in your garage, figure out how you want to store it. Some shelving and clear plastic stackable bins make an ideal organization combo. Most manufacturers of garage ­organizing systems offer free space planning, so use their services as you research how to store all your gear. Before buying anything, take down your garage’s dimensions and note the size and location of windows, doors, switches, and receptacles, as well as how much space your car takes up. The garage ceiling is also a great spot for hanging long, flat items you don’t use every day, such as ladders and seasonal sports gear. Just make sure that any shelves you hang from the ceiling don’t interfere with the operation of your garage door, and that there is enough clearance to avoid scraping the roof of your car. The walls of a garage are great for hanging ladders, sports gear, and bikes. knocked over by your car. Place frequently used items close to the garage door. Stash seasonal or rarely used items (like Christmas decorations) in the hardest­-to-reach spots or up on rafters. 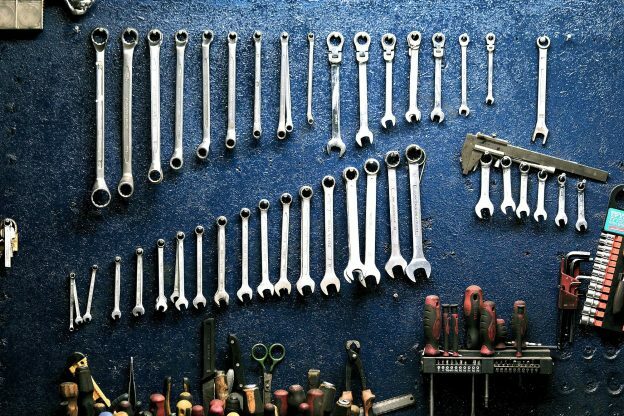 Now that your garage is organized, let’s keep it that way! Check-in each seasonally to make sure the plan is still working. At least once a year (I recommend twice) sort through your belongings and sell, donate, or toss what you don’t need. Keep an empty box in the corner and when it is full, donate it all. Lives change, so don’t be too rigid with your system. Just because the design worked last year, doesn’t mean has to stay that way. You may have to shift items around to make your organization system work for you (instead of the other way around). Keep insects at bay with a pesticide that relies on natural ingredients. Keep a bag of kitty litter handy for absorbing oil and grease spills. Keep a broom and dustpan to tidy up after working on projects. Regularly hose down or sweep the floor. The garage is the site for many dangerous chemicals and other hazardous materials and equipment. To ensure the safety of your family and your home, make sure all of your items are properly stored. easy-­to-­access spot. It should carry an ABC rating, certifying that it’s effective against wood, oil, and electrical fires. Keep hazardous chemicals (like pesticides and drain cleaners) and dangerous tools (like saws and power tools) out of easy reach. Whether or not you have children or pets, it is a good idea to keep dangerous items out of the way in a locked cabinet, or on a high shelf. Don’t store propane in your garage. A spark could ignite the fumes, so when you put away your grill for the winter, keep the tank outdoors. Store pet food inside. Possums, rats, and other pests can sniff out food if you leave it in your garage, so keep it in a sealed container inside. Install a carbon monoxide detector to give you added peace of mind. Check your garage ­door opener to make sure it has a U.L. ­listed motor. Also make sure that it has an auto-stop feature that will prevent the door from closing in case a child or pet tries to sneak underneath. process faster and easier. Just drop us an email or give us a call!